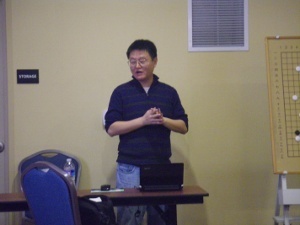 The Seventh North Carolina Workshop with Yuan Zhou was held December 6, 7 & 8, 2013, in Durham, North Carolina. Yuan Zhou 7d told the attendees of the important role Go (WeiQi) continues to play in Chinese culture. Since ancient times, this simple game has served many purposes, including as a method to explain the world we live in. Lao Shi Zhou enlightened the students with explanations of the meaning of the stones, the board, and other features that reflect the structure of the universe. He showed how the 5 elements that make up the traditional Chinese world are also guidelines for proper play, and how these elements of play are interrelated and harmonious. Gold, wood, water, fire and dirt, all concerning life and death, and territory. Lao Shi Zhou is an authority on the famous Go player Go Seigen, and has written a number of books about the man known as the strongest player of the 20th Century. In his lectures teacher Zhou illustrated guidelines for play with examples from the style of Go Seigen, Kabayashi Koichi, Cho Chikun, Lee Changho and others. Yuan Zhou has published over a dozen books on Go, and continues to contribute with more works in progress. Yuan Zhou continues to engage his audience with his unique combination of humor, philosophy, and rigorous game analysis. This workshop devoted even more time to the analysis of attendees' games, helping each player to understand their mistakes and to see their own mistakes in the games of others. The workshop was sponsored by the Triangle Go Group of North Carolina. 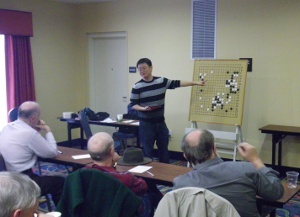 In 1989 Zhou immigrated to the USA and joined the American Go Association (AGA), becoming a US citizen. Zhou earned a BS in Electrical from the University of Maryland, where he was also president of the University of Maryland Go club. Afterwards, he became increasingly involved in AGA events, winning many Go tournaments. Please see the list below for Yuan Zhou's 26 US Go titles. Zhou also served on the AGA Board of Directors in 2005-2007.